What is putting Guelph on the map right now? What distinguishes the city from your Torontos and Montreals in the Great Canadian Scheme of Things? To find out check out this great interview between Joey Sabljic and Ajay Heble in the Guelph Mercury. Ajay will be giving a TED talk entitled, "Improvisation as a Model for Social Change" at the TEDxGuelphU conference on Saturday November 24th at Rozanksi Hall, University of Guelph. For more details please visit the TED page. 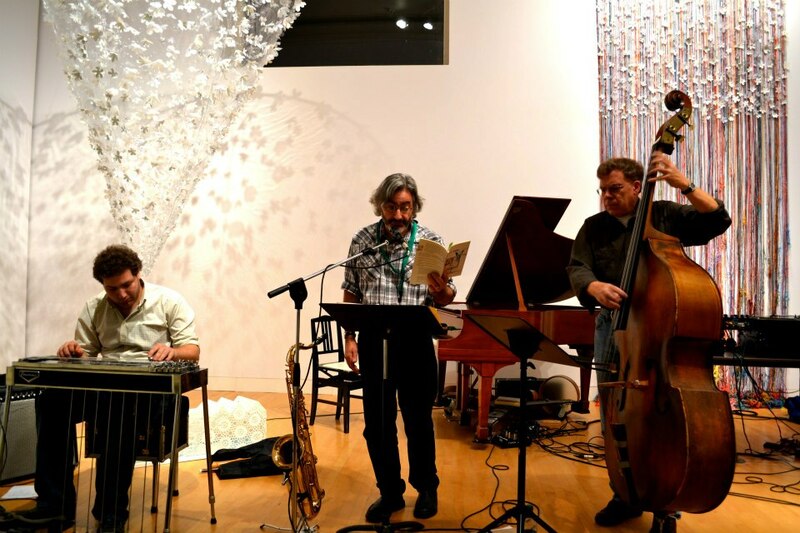 From left to right: Ryan Barwin (pedal steel guitar), Gary Barwin (poet/saxophonist), and David Lee (bass). Photo by Paul Watkins. Paul Watkins (DJ Techné). Photos by Meg Watkins. Moon Phases in action. Photo by Daniel Fischlin. 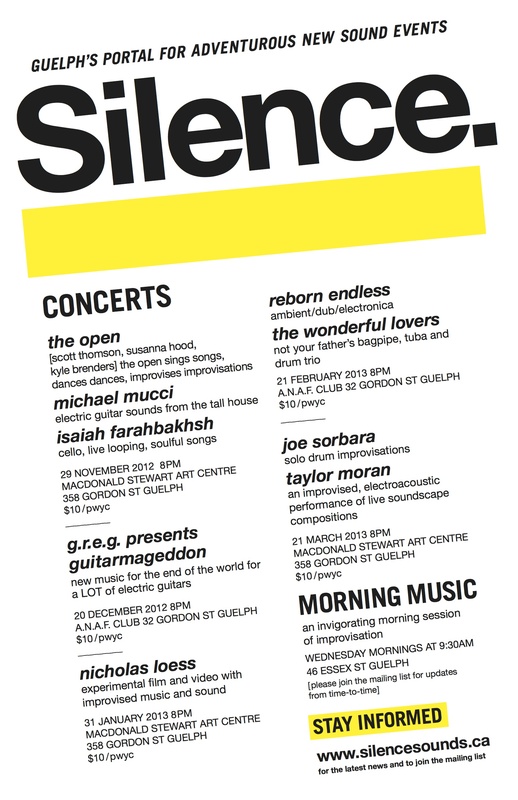 "The Silence series organized by Ben Grossman and Daniel Fischlin got off to a flying start with three very different performances. Offered a spot playing double bass in this series debut, I opted to bring in Hamilton’s brilliant performance poet/saxophonist Gary Barwin, who offered some of his always provocative and hilarious texts and brought his son Ryan Barwin, a quick-eared and responsive pedal steel guitarist. 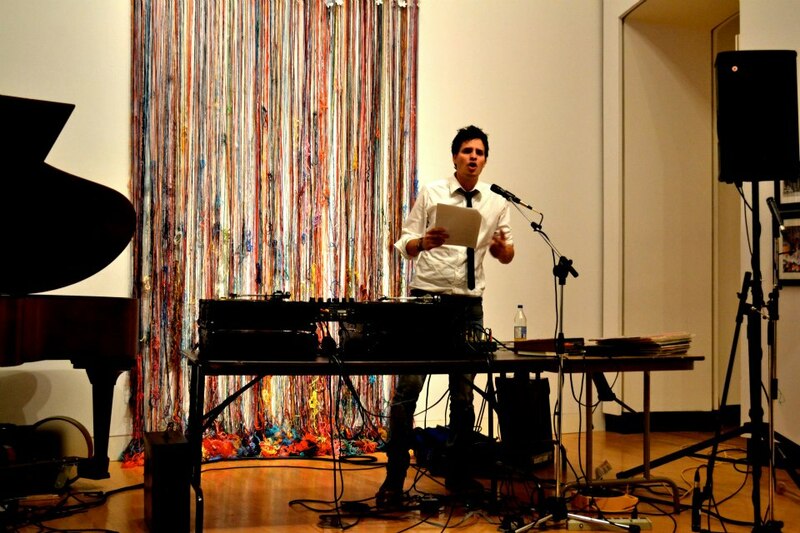 Next up was Paul Watkins, who apologized for forgetting his iPod, and proceeded to manipulate a stack of LPs through an analog aural collage in which the iPod, though absent, was not missed. The final set was a collective of young local improvisers - Alex DesRochers, Esmé Nandorfy-Fischlin, Eden Segal-Grossman, Elena Martin and Maryn Kleinbeernink Work - coached by alto saxophonist Mark Laver, whose sensitive group improvisation incorporating glassworks, percussion, alto saxophone and dance was latterly augmented by more experienced players - baritone saxophonist Brent Rowan, guitarist Daniel Kruger, Gary and Ryan Barwin, Mark and myself - although this group of teenage players, whose own performance was ever-changing, lyrical and evocative, had already proved that they didn’t need our help." Look forward to future Silence events by watching this page. Listen to live clips from the last show. 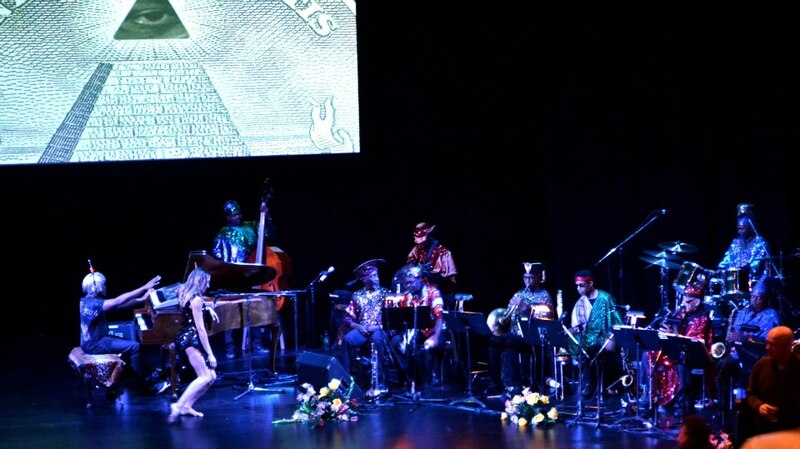 Space is the Place: Sun Ra Arkestra, students from the Regent Park School of Music and the dancers of Coleman Lemieux & Compagnie. Jazz is a mode of democratic action, just as the blues is a mode of deep, tear-soaked individuality. Charlie Parker didn’t give a damn. Jazz is the middle road between invisibility and anger. It is where self-confident creativity resides. Black music is the paradigm for how black people have best dealt with their humanity, their complexity, their good and bad, negative and positive aspects, without being excessively preoccupied with whites. Duke Ellington, Louis Armstrong, and Coltrane were just being themselves. 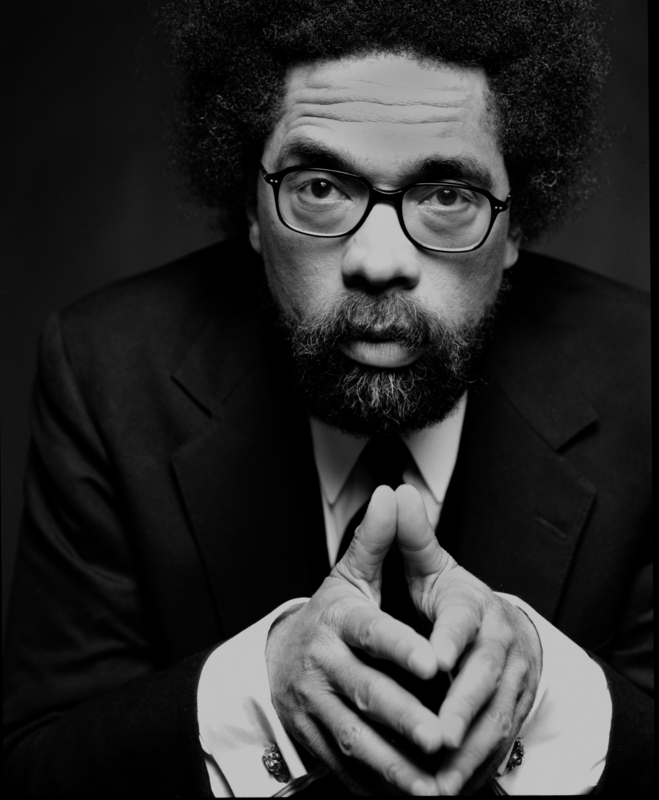 Cornel West is an American philosopher, academic, activist, author, actor, critic and prominent member of the Democratic Socialists of America. The bulk of his work focuses on the role of race, gender, and class in American society and the means by which people act and react to their "radical conditionedness." He is currently a professor of African American Studies at Princeton and of Religious Philosophy and Christian Studies at the Union Theological Seminary in New York. 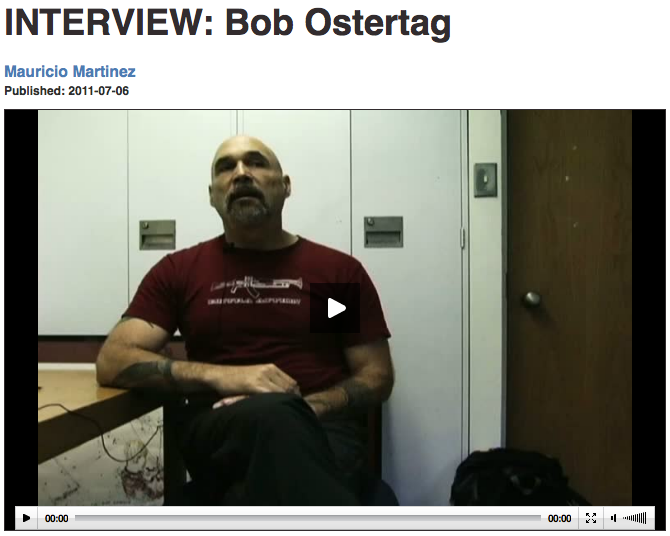 Bob Ostertag is an experimental sound artist, composer, performer, instrument builder, journalist, activist, historian, and kayak instructor based in San Francisco. With ventures into so many diverse fields, Ostertag’s work cannot easily be summarized or pigeon-holed. As a composer and musician, he has released 21 CDs of music. 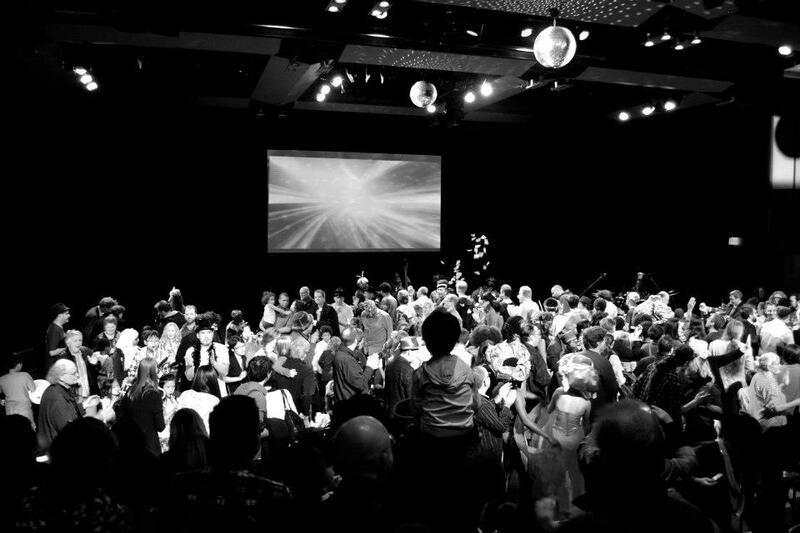 His Living Cinema project (with Pierre Hébert) has released two movies and two DVDs. He has published numerous books on topics ranging from the history of journalism to art and technology. As a journalist, his writings on contemporary politics have been published internationally. Electronic instruments of his own design are at the cutting edge of both music and video performance technology. As a global media artist, he was once involved with the guerrilla group The Yes Men. 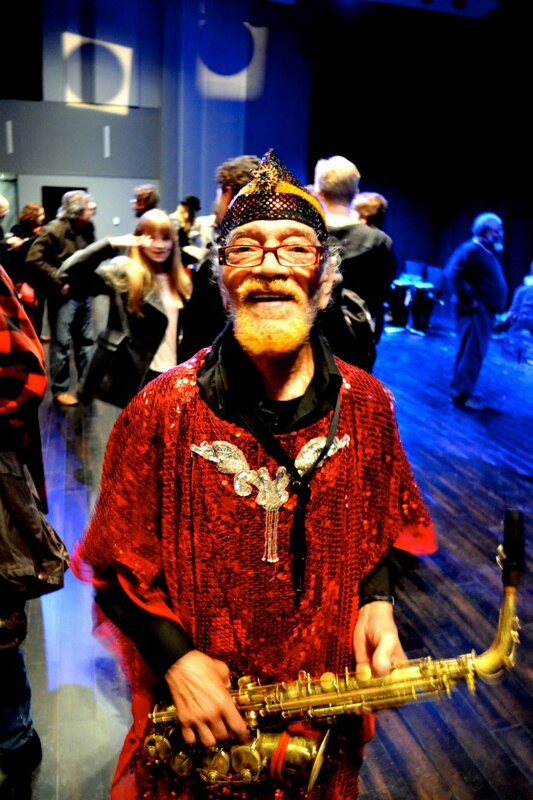 In 1976, he formed the improvisation ensemble Fall Mountain with Ned Rothenberg on reeds and Jim Katzin on violin, himself on electronic keyboard. The ensemble released Early Fall in 1979. 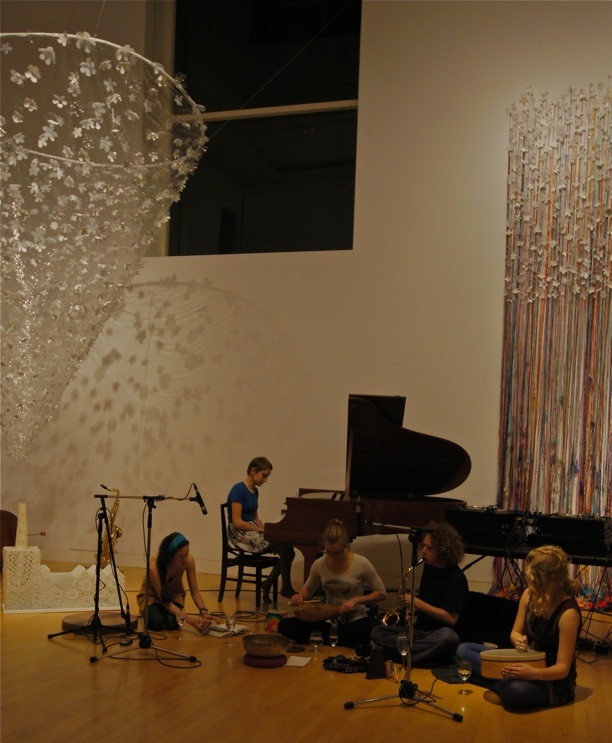 Later that same year, Ostertag relocated to New York City, where he befriended John Zorn, Fred Frith, Zeena Parkins, and several other musicians interested in collaborative improvisation. 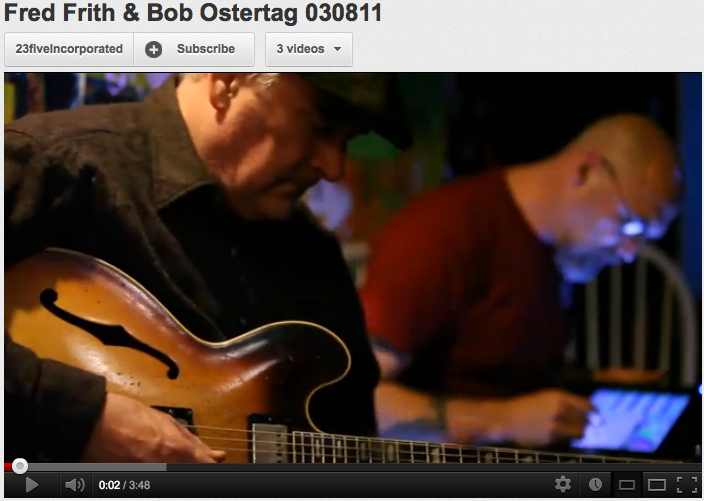 In 1980, Ostertag released Getting a Head with guitarist Fred Frith and drummer Charles Noyes. 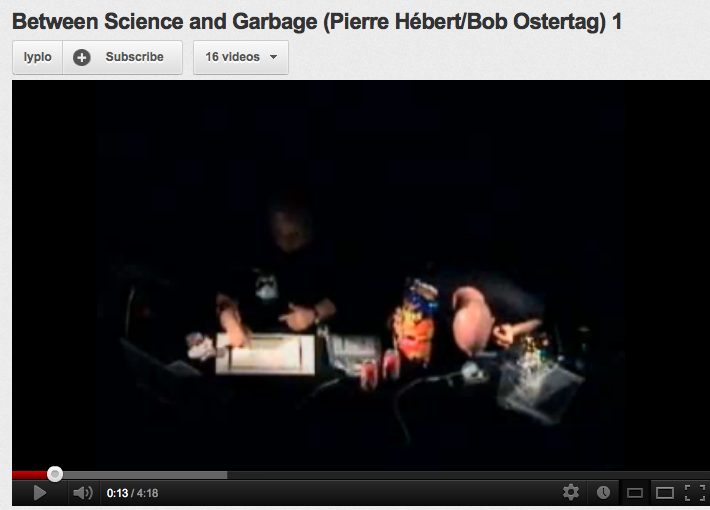 Ostertag’s use of sampling, tape manipulation, and electronic custom-made instruments created a unique sound and approach to improvised music. 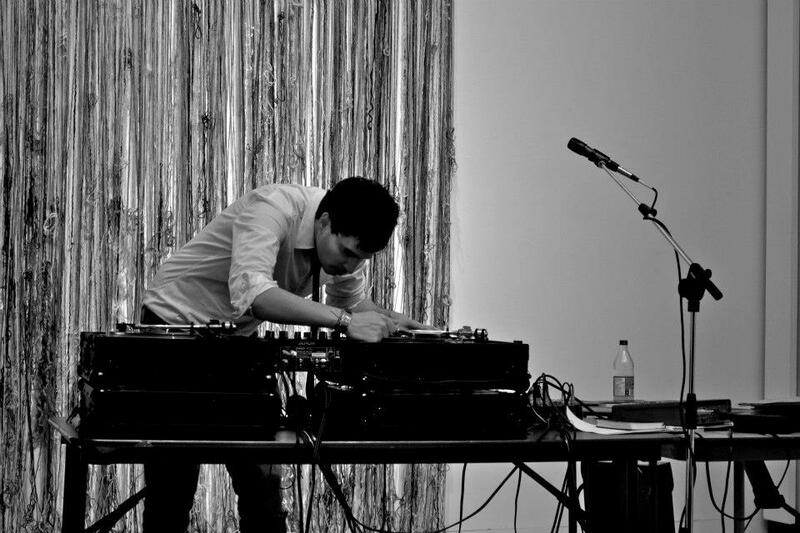 Following the release of Getting a Head, Ostertag became the first of his generation of musicians to have his work presented at The Kitchen, at the time New York City's premiere venue for new music. With his sudden success came a greater involvement in politics, specifically in the turbulent revolutions and counter-revolutions of South America in the 1980s. In response to the political climate, Ostertag released Voice of America. 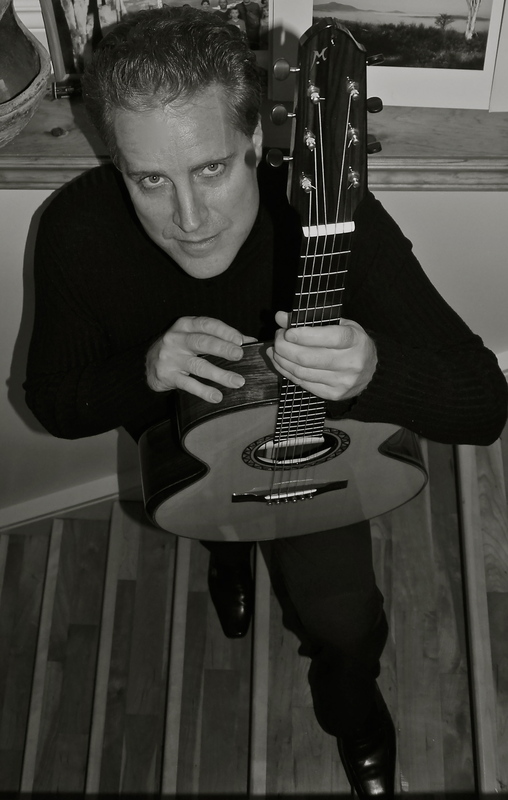 As Ostertag became increasingly involved in political issues, and increasingly dissatisfied with the music industry, he moved to El Salvador in 1982 and, for nearly seven years, abandoned music altogether. His experiences in El Salvador were later synthesized into his piece Sooner or Later. In 1999, after 10 years of working with the same Ensoniq ASR-10 sampler, Ostertag switched to a laptop computer and began writing his own audio performance software through Max/MSP. This allows him to use various controllers, including joysticks, game pads, and drawing tablets in his performances. On March 25, 2006, Ostertag made all of his recordings to which he owns the rights available as digital downloads under a Creative Commons Attribution-NonCommercial 2.5 license. 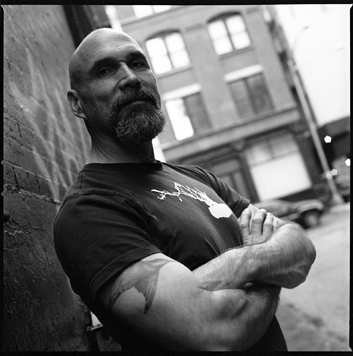 Bob Ostertag is currently Professor in the faculty of Technocultural Studies at UC Davis. 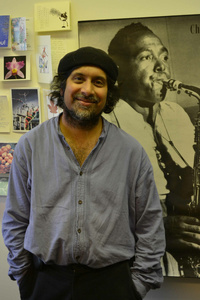 The international symposium, "Lost in Diversity: A Transatlantic Dialogue on the Social Relevance of Jazz" took place from November 8th - 9th at the Heidelberg Centre for American Studies, Heidelberg, Germany. The symposium featured a keynote address by project researcher, Daniel Fischlin, a University Research Chair and Full Professor of English and Theatre Studies at the University of Guelph. Sessions included the following topics of note: "Jazz and Human Rights," "American Idols - European Identity," and "Jazz and Politics." The symposium also featured "Piano Lectures" by Alexander von Schlippenbach and Vijay Iyer, as well as a "DJ Lecture" by Thomas Meinecke. For a copy of the official program, please click here. For a copy of the schedule of events, please click here. The SMT Interest Group on Improvisation is proposing a three-hour special session on the improvisation-based theory teaching of Professor Peter Schubert of McGill University, to be submitted for consideration by the 2013 SMT Program Committee. We welcome proposals that would build on or complement different aspects of the innovative teaching of Professor Schubert. 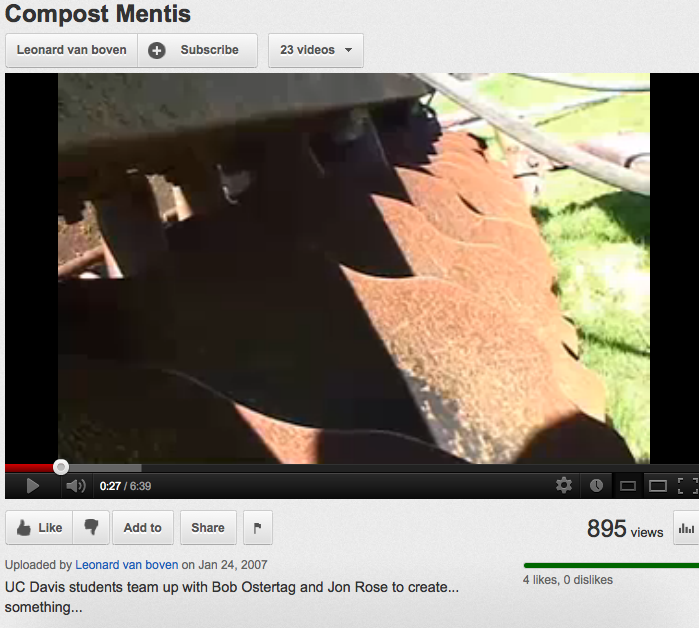 In particular, we are interested in workshops or lecture/demonstrations in addition to typical 35-minute papers. 1. A proposal of no more than 500 words, including any footnotes or endnotes. A maximum of four pages of supplementary materials (such as musical examples, diagrams, and selected bibliography) may be appended; these pages will not be counted within the 500-word limit. 2. The proposal must include the title of the paper but exclude the author’s name and any other identifying information. References to the author’s own work must occur in the third person. 3. Identification and contact information, including the name, postal address, e-mail address, and telephone number of the author(s), as well as the rank and institutional affiliation, if any, should be included in an e-mail submission. Put all cover letter information in the body of an e-mail message, with the proposal as a separate attachment. All attachments must be either MS Word documents or pdfs. Send e-mail submissions to: Professor Vincent Benitez at vpb2@psu.edu with the subject line: “SMT IMPROV Special Session Proposal.” Submissions will be acknowledged by e-mail only.